Have the opportunity to visit the biggest two cities of Egypt , Cairo the biggest city in Africa and the capital of Egypt and Alexandria Egypt 's major port founded by Alexander the great. Enjoy Cairo the modern capital of an ancient land .explore Aswan (where Arabia meets Africa and the Nile is its most beautiful). Com –ombu and Edfu. Discover the secrets of Luxor, Karnak and more. Enjoy sailing by felucca through Egypt 's open air museum from Aswan to Luxor –Com ombu ,Edfu ,Karnak and more ………the tour also includes Cairo high lights. 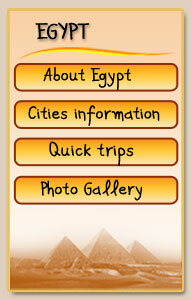 Visit all of Egypt 's historical sites and desert attractions in one trip? Explore Cairo , Giza , Aswan , Com-ombu, Edfu and western oases plus 2 nights cursing in the Nile between Aswan and Luxor . Explore the best of Egypt's historical and tourist sites in one trip and in budget price with tour tour see the pyramids, Cairo, Luxor, Aswan, Dahab st.catherine and more.